1. Read this webpage completely. 2. Submit your Intent to Participate by SIGNING UP BELOW. 3. 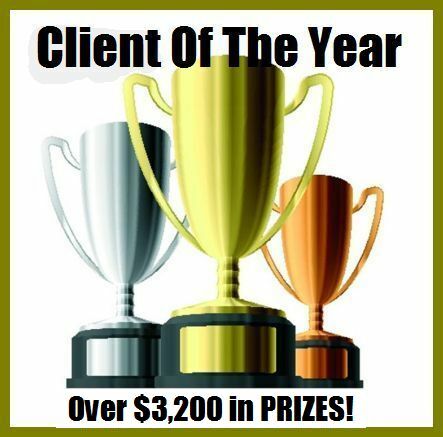 After submitting your Intent to Participate we will immediately email you the Official 2014 Client of the Year Contest entry package. For years now, Get You In Shape has had an Annual Client of the Year Contest along with a Client Appreciation and Christmas Party. It’s been great to see Get You In Shape’s Core Value #3 (Help motivate each client to a life healthy lifestyle so they can pay it forward) played out as we have heard some incredible stories of people sharing how our program has helped change their health and their future. But Are You Good Enough To Win? We believe in you. The only question is…do YOU Believe? This contest is about more than just who had the biggest weight loss or who lost the most inches. In fact, having the biggest number doesn’t guarantee you will be selected as one of the finalist for the Get You In Shape Client of the Year. This contest is about you and your personal story…it’s about the changes that you have made and the life you are creating! Because more than just inches and weight, this contest is about breakthroughs, implementing the tips we have given you, overcoming obstacles, changes, determination, perseverance, drive and growth. And we are pretty darn certain there is some element of your story – your personal health and fitness victories – that warrants your participation in the Get You In Shape Client of the Year Contest. Honestly, we expect you to participate – to compete for these prizes because you are good enough to win. Again, do not count yourself out. Just because you may not have perfect attendance, you don’t do your of-day cardio all the time, may not have the most weight loss success (or any weight loss for that matter), this is not going to be the difference between the winner of this contest. We are looking for people who have made big changes in their life and Get You In Shape has helped you do that. One reason why we do the Client of the Year each year is to help you look back on your journey with Get You In Shape. To help you see how far you have come from since you took that first step out of your car that first Get You In Shape fitness session. We want you to look back and see all the positives that have come from saying YES to your personal health and fitness. We want you to see the positive changes that you have been able to make. This will help you re-live some of the experiences in the first month or first number months of the program. It will allow you to see how much you have progressed and transformed over the months. This will also help get you to “pay it forward.” As you know, one of our core values at Get You In Shape is to help educate and motivate each client to change so they can “pay it forward”. By signing up for Client of the Year, you will be able to encourage, inspire, and motivate someone that may be in the same shoes you were in when you started to make a change. Not only that, but it will immediately help inspire your fellow Get You In Shape workout buddies who are with you. We love seeing how lives have been changed through the Get You In Shape program. We want to continue to strive to push each and every client of ours to reach to new levels of success. We want to continue to help give YOU motivation and inspiration to move forward. Because of this, we are having our 5th Annual “Client of the Year Contest.” This is not only an opportunity to win great prizes and be recognized for all your hard work, but it also is a great opportunity to share your story and inspire someone else. Don’t count yourself out!! “If only” must be the two saddest words in the world. “Regret for the things we did can be tempered by time; it is regret for the things we did not do that is inconsolable.” I’m not sure who said that, but they are words to live by. This is your “get out of the box” moment. You can and should take this shot…because there is zero downside risk, and the upside can be nothing short of huge for you. We’re not making a mountain out of a molehill here – the Get You In Shape Client of the Year can be the thing that puts you over the top. We talk about this phenomenon all the time. It is the principle of “putting yourself out there” – and it always pays huge dividends. 1. Implementation and Results: What have you done? What action steps have you taken in the past number of months? What tips, strategies, and changes have you made in your life? And what were the results? Higher marks will be awarded to those who quantifiably document the results. 2. Personal Growth: How has implementing and getting results helped you grow? What breakthroughs have you experienced? What opportunities have presented themselves because of actions you’ve taken? How is your life better today than it was before starting the Get You In Shape Program? Be as specific as possible. The bottom line is CHANGE. More than just inches and weight loss (which is also great), here at Get You In Shape, we pride ourselves on being agents of change. And we’re looking for evidence of that change in you because of your participation in the Get You In Shape Program. The sharper the contrast between before and after – the greater the change – the better. In addition to the prizes, publicity and notoriety you get if you win, there is a hidden benefit everyone who enters will enjoy. And it’s profound. Just taking the time to THINK about your life since starting the Get You In Shape Program, and then to DOCUMENT what you did – the actions you took, tips, tools and changes you implemented – and how they worked…will give you a level of clarity about what you have accomplished that nothing else can. Nothing. It is precisely this kind of REVIEW that is critical to your continued results…and unfortunately, it’s this kind of review we rarely ever see. And that’s not good. With our Get You In Shape Client of the Year Contest, we’re incentive you to do the review that will propel you upward faster and higher than any other activity you can do. If you are truly serious about your continued HEALTH AND FITNESS results..with speed..then I urge you sign up and share your Get You In Shape Story with us. Grand Prize – $250 CASH + SIX Free Months of the Get You In Shape Fitness program (up to a $1134 Value). Who wouldn’t want a $250 to help pay for Christmas gifts, a weekend getaway, a new wardrobe because your clothes don’t fit anymore, or whatever else you normally would not spend on YOURSELF. As an additional incentive, we are throwing in SIX Free Months of our Get You In Shape program. Altogether, 1st place prize wins over $1,350 in prizes! Runner Up $100 CASH + 3 Free Months of GYIS Fitness ($657 Value). 2nd Place wins more than $800 in Prizes! 3rd Place wins more than $400 in Prizes! THE WINNER’S will be announced December 4th at the Client Appreciation Party.